Kieren as part of our Day Options program over on Kangaroo Island has been supported to volunteer his time, labour and skills on a weekly basis to look after and maintain the Gardens at Penneshaw Cemetery for the Kangaroo Island Council as well as the gardens at Tourism Kangaroo Island. Under the guidance of the Kangaroo Island Council, Kieren has worked tirelessly weeding and raking to ensure the Gardens provide a relaxing and picturesque environment for all to enjoy. 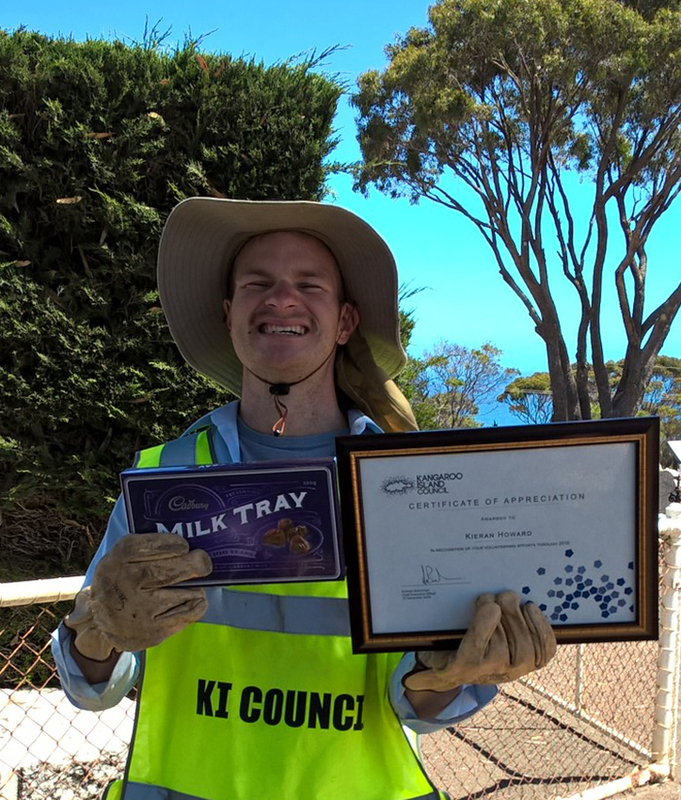 Brian Paget, Supervisor for maintenance of the parks and gardens at the Kangaroo Island Council, says: "Kieren has done a fantastic job and the Kangaroo Island Council are very pleased with his work. We thank him for doing such a wonderful job and for his dedication to contributing and giving back to the local community." "Our focus as an organisation is to support our clients to live in and be active members of their local communities. It is great to see Kieren using his skills and interests to participate and give back to his local community and we thank the Kangaroo Island Council and Tourism Kangaroo Island for giving Kieren the opportunity," said Mark Kulinski, Chief Executive of Community Living Australia. Suzi Lines, Community Living Australia's Regional Coordinator for Kangaroo Island adds, "Kieren really enjoys the work he is doing and you can see the benefits in his added level of motivation and self-esteem. Kieren knows he is providing value to his community and he is thriving off of the social connections he is making. Sometimes that is all people living with disability need - the opportunity to contribute being given to them"
Tourism Kangaroo Island will be looking to utilise Kieren's services even more regularly moving forward with Kieren looking forward to continuing his work at the cemetery whilst being able to further give back to his community and develop his skills.